Powerful 350 watts motor with 2 speeds and pulse mode. Large pulp bin is easy to remove and clean. Large 22 oz. juice cup. Brush included for easy cleaning. 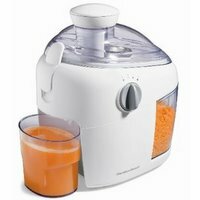 Star Rating 3.4 User reviews, ratings, and feedback indicates that this juicer is rated lower than average by 7 users and ranks in the bottom 20% of juicers.